Use FaceTime to make video or audio calls to other iOS devices or computers that support FaceTime. 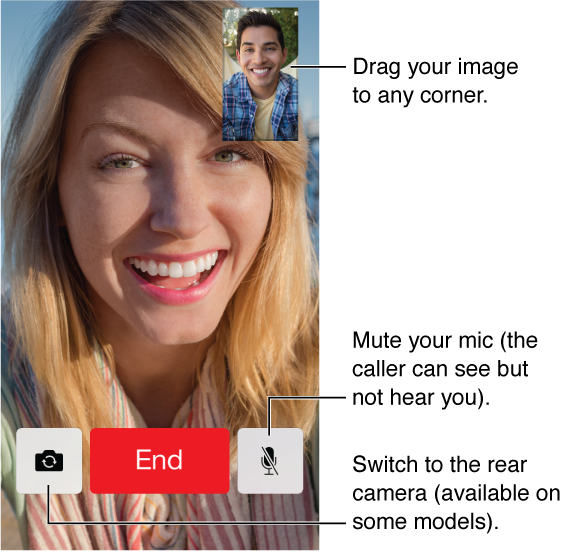 The FaceTime camera lets you talk face-to-face; switch to the rear iSight camera (not available on all models) to share what you see around you. Note: FaceTime may not be available in all areas. With a Wi-Fi connection and an Apple ID, you can make and receive FaceTime calls (first sign in using your Apple ID, or create a new account). On iPhone 4s or later, you can also make FaceTime calls over a cellular data connection, which may incur additional charges. To turn off this feature, go to Settings > Cellular. For more information about cellular usage and settings, see Cellular settings.